Crochet flower patterns are perfect for a diverse array of projects. They can be used as appliqués on everything from hats to shoes. Crochet flowers can be strung together as bunting, placed on tables as coasters and used in large-scale works of art, including yarnbombing. You will find an almost endless variety of patterns to use to create specific flowers (such as roses and sunflowers) as well as non-specific flowers of all sizes. This collection of 25 patterns features flowers that are easy and creative. Crochet Flower Bow Free Pattern. This fast flower pattern works up in just minutes. 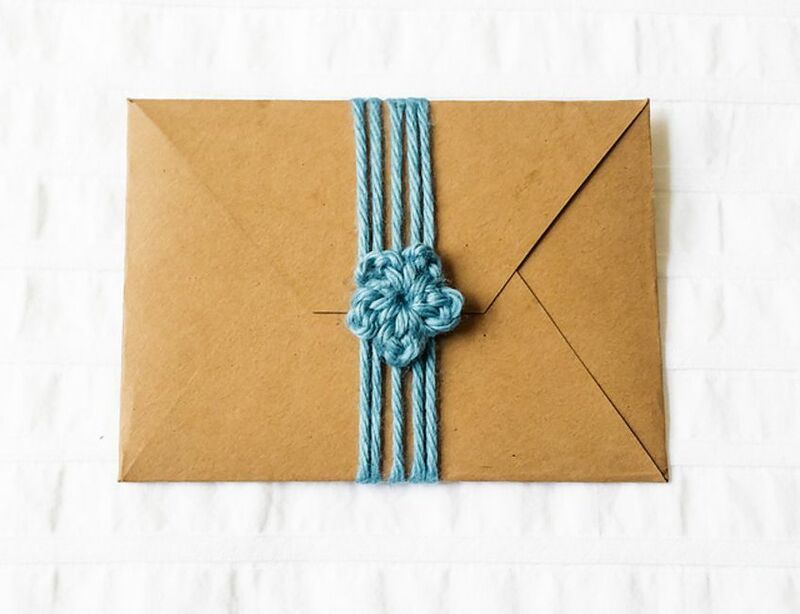 What makes it special is that it's attached to a long length of yarn to create a bow that can be used to wrap around envelopes, boxes, and other packages. It instantly makes any gift a little bit more special. Free Crochet Flower Scrubbie Pattern. This three-round crochet flower is a basic design that works up very quickly and will give you a solid foundation for how to crochet a flower. Work it in cotton yarn to create a face scrubby or use it as a coaster. Open Crochet Flower Free Pattern. When you crochet this two-round, five-petal flower, it will have a buttonhole right in the center of it. You can add the button to attach the flower to an item such as a hat. Alternatively, you can simply leave it open for a lacy floral design. The pattern comes with written instructions as well as a video tutorial. Crochet Cherry Blossom Free Pattern. This is a four-round five-petal free crochet pattern. The colors, along with the shaping, create a cherry blossom perfect for decorating in spring. The pattern comes with written instructions as well as a symbol chart. Crochet designer In The Yarn Garden also offers a few other free crochet flower patterns. This delicate crochet flower has five slightly-overlapping petals. Each petal is outlined in a second color that is also used as a detail line within the petal. This extra touch makes the basic flower stand out above many other similar patterns. The designer, Happy Crochet by Vita on Etsy also offers many other crochet flower patterns in her shop. T-shirt Yarn Crochet Flower Pattern. This easy crochet flower pattern is designed to be made with t-shirt yarn for a nice chunky design created in just a few rounds of crafting. Of course, you can use the pattern to make flowers in other yarn as well. Designer Anneke Wiese notes that if you join a few dozen of these flowers made in DK weight yarn you'll have a beautiful floral baby blanket. This is a seven-round crochet flower pattern, so it requires a little bit more work than some of the simplest designs, but it is still an easy flower to crochet. What makes it really special is the textured stitches that give it an extra dimension. This pattern is part of a complete set of crochet flower patterns designed by different people, called 365 Days of Crochet Flowers. The whole set can be found through The Crochet Hookup on Instagram. This is another crochet flower that's part of the 365 Days of Flowers project. It uses picot stitch to give definition to each of the petals. Changing colors in each round will make this flower pattern especially striking. Crochet Flower Peony Free Pattern. This free flower pattern actually includes instructions to make four different items–one small flower, one that's larger, one that's just a small bud and a leaf to add on to them. You can create a single peony or an entire bouquet of ruffled flowers. Crochet Poppy Free Flower Pattern. There is a small, subtle color change at the center of this poppy. Simple stitches worked in only one loop create the dimensional petals that give you the poppy shape. Lacy Crochet Flower Brooch Pattern. This is a delicate lace flower made with crochet thread. The center of the flower can be made from yellow thread or replaced with a pearl button. The small flower is intended to be worn as a crocheted brooch, but it could also work as earrings and other jewelry or added to clothing as an appliqué. Designer Fox Stitch Design has a terrific collection of crochet flower patterns including some designed for advanced crafters. Leticia Lebron on Ravelry, also known as Flawless Flowers, is another crochet designer to check out if you love to make crochet flowers. This one is her Princess Diana Clematis flower, a climbing vine that can be used to create a decorative arrangement over one foot in height. These crochet tulips look complicated but they are actually a beginner project. The shape of the crochet flower is simple, and then you need to use some extra DIY skills (glue, flower sticks) to complete the project. Easy Free Crochet Flower Pattern. It might be hard to believe, but this charming crochet flower pattern is made in one simple round. By working chains into slip stitches, you create the loops that become the petals of the flower. Depending on your yarn and hook size, you can vary the size of the flower significantly, making it a design that you can use for many different projects. Layered Crochet Flower Free Pattern. This pattern is so-named for the very unique center that looks a little bit like a gumdrop. This free crochet flower pattern provides a great opportunity to practice working a flower in layers to create a ruffled 3D design. 3D Crochet Flower Free Pattern. This pattern shows another way to make a three-dimensional crochet flower. Follow the 30-minute video tutorial, at the end of which you will have created a detailed, creative plant you won't have to water. It is especially striking worked in two colors but can be worked as a solid color as well. Here is yet one more way to create a three-dimensional crochet flower. It is worked in three rounds and uses a variation on hyperbolic crochet to give the petals their ruffled edges. Crochet Flower Keychain Free Pattern. Make a small crochet flower that packs a big punch thanks to the big bobble stitches it uses. Add a simple chain stitch loop to turn this flower into a keychain. In addition to making the flower, you can make a crochet basket or pot for your flower. This type of complete project makes a great housewarming gift. It is the perfect decor for anyone without a green thumb! This cotton crochet pattern is a great example of a simple design that works well as a coaster. The center of the flower is large enough to lay flat and hold a glass. The edges are designed to create decorative petals that make the crochet flower shape. Crochet Flower Headband Free Pattern. This is a crochet headband pattern that includes instructions for crocheting two different types of flowers. One is a rose and the other is a Johnny Jump-Up. You'll also find additional free crochet flower patterns from this designer. Puff Stitch Crochet Flower Free Pattern. If you want to make a small textured crochet flower then this puff stitch flower is a nice choice. As a bonus, you can go past the two rounds that make the flower and learn how to make a crochet flower square with this at the center–and then learn how to join them into a crochet shawl! Crochet Flower Necklace Free Pattern. This three-round, six petal crochet flower is made with a simple half double and double crochet stitches. Crochet chains are added to make a necklace. This free pattern has written instructions as well as a video for both left- and right-handed crafters. This is a crochet baby blanket pattern worked in the round and designed to look like a blooming flower. The same pattern worked in t-shirt yarn would make a great flower rug.